Heading home today via the station named after my German region of residence, I was startled to see, neatly affixed to the wall above the escalator, a new enamel plaque indicating a change of station name: elegant white letters on a deep blue background proclaimed: CHELSEA-MANNING-PLATZ, or Chelsea-Manning-Square. Really? Are Germans that cool, or was the sign just the work of a politically-inclined prankster? City of openmindedness or lone wolf? Wolverine? Presumably the latter--my son couldn't believe how gullible I was ("They don't use that font on signs here, Mom!") and since I find no information about new names for stations in our local news, but I admire the taste and resourcefulness of the person who put the sign there. In my defense, I've seen that font elsewhere. Quite nearby. Looking quite professional and really hard to reach, the sign gleams with a certain cocky pride at the skinheads who can't pull it down. I bet someone made an effort to get that thing on the wall in such a way that it'd be hell to remove. I imagine that someone dangling, Mission-Impossible style, from the ceiling to place the sign. My students have been reading Jennifer Finney Boylan's entertaining exploration of her transgender experience, so the new name struck me as the universe's stamp of approval for acceptance and tolerance. A long time ago in a galaxy far away, there was a country, the United States of America, that had a real president. Not the thug with economic tentacles running so deep that even if they all got sliced, he'd pop out new ones faster than the many-headed hydra. Not the guy who could shoot someone on Fifth Avenue and still get elected. 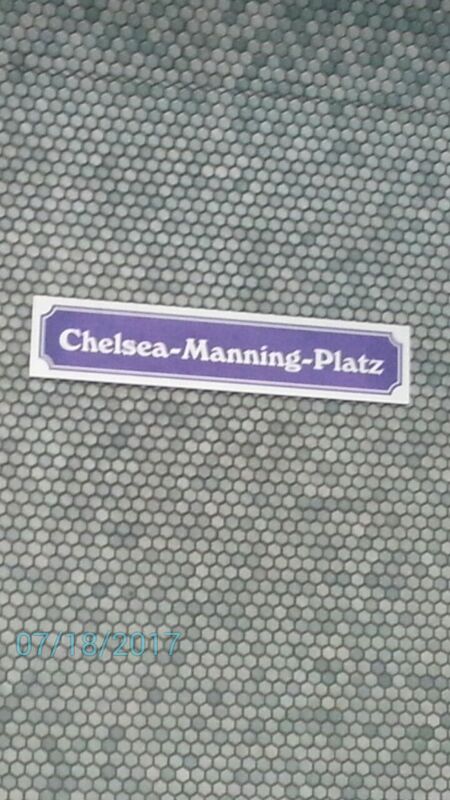 But here, in a small city in Deutschland, we've got a Chelsea-Manning-Platz. When will be get an Edward-Snowden-Square? Listen, my clever ideologue, you who puts up signs: this time pick a place where everyone will see your sign. How about Hauptbahnhof? Post Hoc, 15 August: I came down the escalator and glanced over at the wall, and alas! 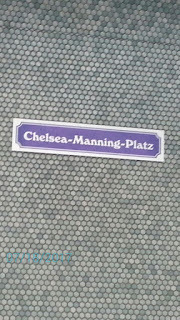 No more Chelsea-Manning-Platz. Damn. Put back that sign, please!